Formed in 1988 due to the expanded business and growth of Lynch Livestock, Inc. 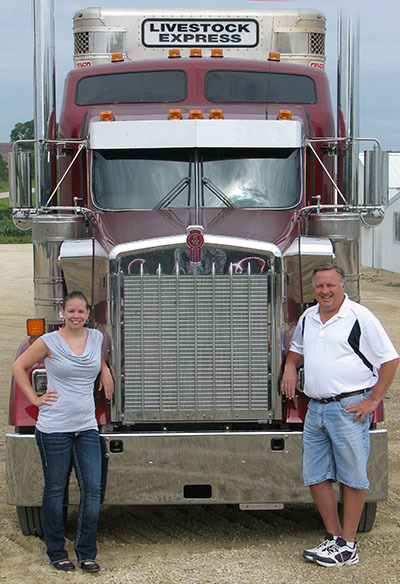 Currently operates 26 semi tractors and 43 livestock, reefer, feed and grain trailers. There are 11 owner/operators pulling company trailers also. It is a top priority at Livestock Express to implement strict biosecurity procedures to insure we have clean and disinfected unloading facilities, trucks and trailers. Biosecure chutes are available upon request. Leads the trucking industry in requiring all truck operators to be Trucking Quality Assurance Certified (TQA). We take pride in providing timely services to producers and packing plants in a professional manner while maintaining the hightest safety and animal handling standards throughout the industry.